﻿ Development, design, manufacture and marketing of cosmetics. Each skin type needs its own kind of care, we manufacture it. We develop a wide variety of cosmetic products. Standard or customised formulas, special textures and made-to-order packaging. We give advice throughout the entire process (360º). From the time of the initial idea until your product is launched on the market: ranging from the creative process, manufacturing, quality, packaging, marketing and regulatory affairs. Our more than 40 years of experience have meant that prestigious multinationals in the pharmaceutics, dermatological and hospitality sectors, among others, have put their trust in us. We have our own laboratory with state-of-the-art equipment, which enables us to develop innovative, efficacious products in a streamlined manner. Our facilities are located in a single plant in Barcelona, thereby ensuring optimum quality control and traceability throughout the entire process. Dr. Bach established IDESCO among a group of companies engaged in cosmetic research and clinical diagnostics. IDESCO made the first collagen cream in Spain. That made us pioneers in developing cosmetics on the Spanish market. The facilities are expanded with a new 2500 m2 production plant. 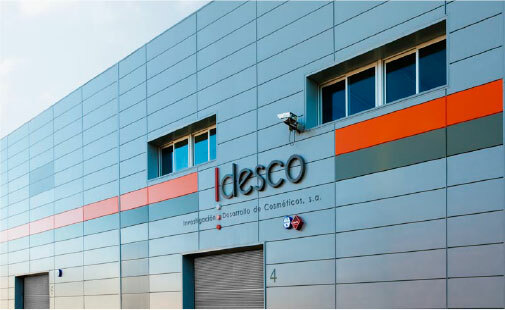 IDESCO’s third party division, with headquarters in Barcelona, was founded. Strong national and international presence (Europe, Asia, Central America). We expanded our storage capacity with a central, 1200-place warehouse. Pioneers in Spain with the acquisition of BactiFlow equipment that reduces the total production processing time. IDESCO’s third party division continues positioning itself nationally and internationally as a benchmark in the cosmetic sector.